I started playing Tom Clancy’s Rainbow Six Siege in the closed beta. It was a fun game but I can’t see buying it for more than $30. I just have too many other FPSs to play at the moment. The concept is interesting compared to the typical call of duty and battlefield games, but it wasn’t anything so unique that I had to have it on day one of the release or couldn’t wait a year until there was a 50% off sale. 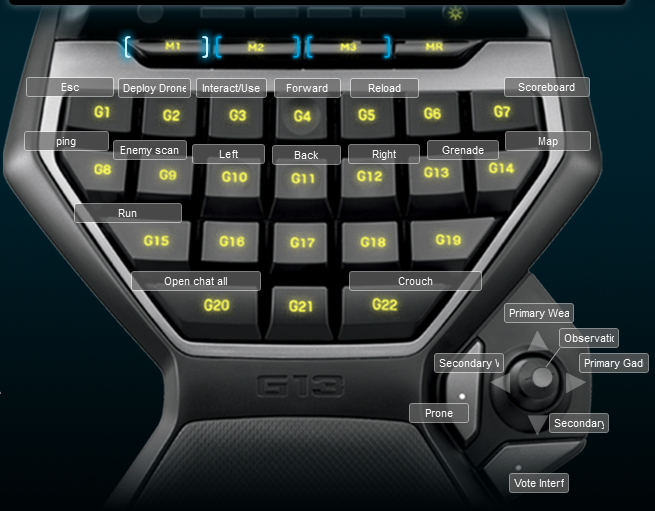 I created a Logitech G13 profile because at the time none existed because I was in the beta. I haven’t searched for one because I have yet to buy the game. I figured I would post this in case it helps anyone else. Below is the image of the keyboard layout for the game. I kept the mouse layout the same as I always do with melee and jump on my extra buttons.